The 1990s in Irish politics brought with it a seemingly endless torrent of revelations and scandals, particularly concerning the conduct of various political figures in the previous decades. The tribunals which were set up as a result identified a potential obstacle to their investigations of political corruption - the right of confidentiality enjoyed by the Cabinet in official meetings, as enshrined in Article 28 of the Constitution. This right was upheld by the Supreme Court in 1992. In the mid-1990s, John Bruton's Fine Gael/Labour coalition drafted a proposed amendment to the Constitution that would allow cabinet confidentiality to be relaxed "in the interests of the administration of justice by a Court" or "by virtue of an overriding public interest" via a tribunal of inquiry. 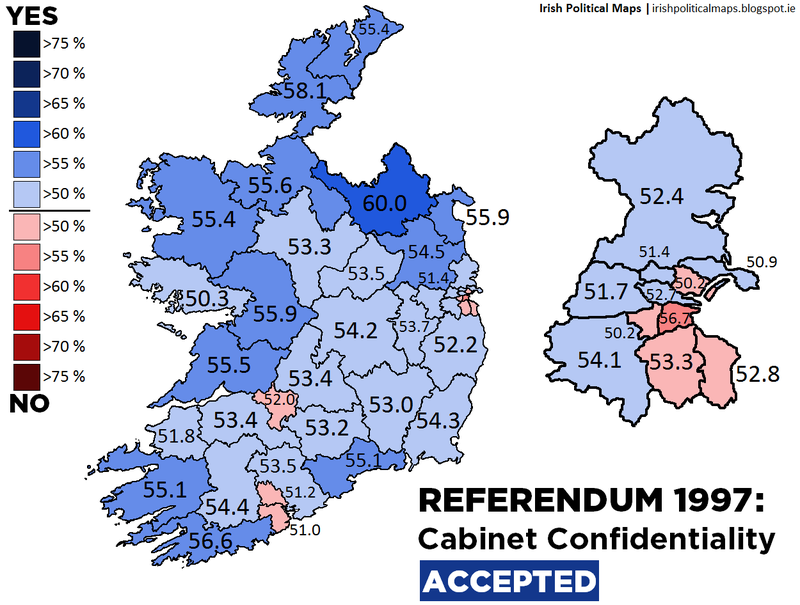 Bruton's Government lost office before the amendment could go to a referendum, but it enjoyed the support of the new Fianna Fáil/Progressive Democrat coalition led by Bertie Ahern, thus ensuring no opposition from any of the then-major political parties. At the time, Ahern had made a number of speeches committing Fianna Fáil to rooting out political corruption in Ireland. Despite some opposition from the Bar Council, the referendum passed with a majority 52.7%. The highest votes against the amendment were recorded in urban areas such as Cork North and South Central, Limerick East, and the south-eastern Dublin constituencies. Dublin South East had the highest No vote at 56.7%. Cavan-Monaghan had the highest Yes vote at 60%. A relatively high turnout (47%) was ensured by the referendum being held on the same day as the 1997 presidential election.